During the years of the Bush/Cheney regime, many people displayed the American flag upside-down as a signal of distress. 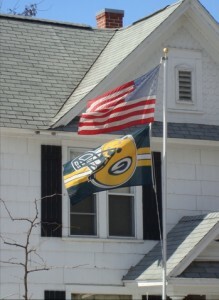 A Green Bay Packer flag flies upside-down on a late February afternoon in La Crosse. I mean, weren’t they 11-6 this season? WTF?